Mr Corbyn acknowledged that there is a majority for unity across Ireland and reiterated his support for Irish reunification in the context of the 1998 peace deal. 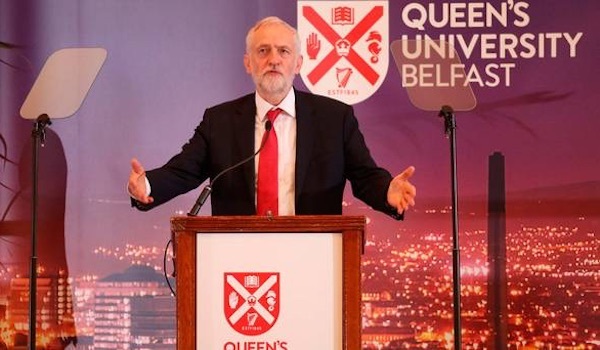 In a speech in Belfast on Thursday, Mr Corbyn said that Labour is as committed to the Good Friday Agreement as it has ever been. “It has served us well for 20 years and, with commitment and determination, will provide us with the framework for the next 20,” he said. “And with that in mind I want to make a plea to all parties and all sides. We must do all we can to make powersharing work again in Stormont. We need all sides to come together and make devolution work again. He urged British prime minister Theresa May to revive the moribund ‘British Irish Intergovernmental Conference’, a body set up under the Agreement to provide Dublin with a consultative role in non-devolved matters concerning the North. Nationalists have been demanding the re-establishment of the conference as a means of dealing with collapse of power-sharing in Belfast, but have so far been ignored by the British government. It last sat eleven years ago. The DUP have refused to support the body as it opposes any Dublin government involvement in the North, directly or indirectly. The DUP leader Arlene Foster described the conference as a “talking shop” and instead called for British Direct Rule ministers to take decisions for the Six Counties. In a speech last week, Foster accused nationalism of being ‘narrow and exclusive’ while lauding unionism as standing for ‘pluralism and multi-culturalism’. The DUP leader accused the Dublin government of a “very aggressive” Brexit stance that made unionists wonder if 26 Counties was asserting a claim on the north. But she claimed the issues that led to the collapse of the Stormont Assembly could be resolved. Sinn Fein, meanwhile, warned the DUP have no interest in restoring the Assembly -- because Brexit could bring significantly enhanced powers to the north of Ireland. The party pointed to revealing comments by the Scottish Brexit Secretary Michael Russell, who said the DUP were blocking the transfer of powers from Brussels to Belfast due to a fear of how Sinn Féin might use them. The British government had published proposals that would see the “vast majority” of powers in Brussels go directly to the devolved assemblies after Brexit, but that now appears on hold because of pressure from unionists in the north of Ireland. After talks on the issue in London, Mr Russell said he was told devolution was being “subverted” because of “fear of what Sinn Fein might do in a legitimate assembly”. He said he had concerns over the influence the DUP has over the British government. “We don’t take part in Northern Irish politics, that is an issue for people in Northern Ireland, but it does seem that if the DUP is in a position to veto things happening in Westminster – to veto devolved settlements – then we’re in a dangerous situation,” he said. Sinn Féin’s Alex Maskey said the remarks raised questions over British government’s commitment to restoring the political institutions in the north. “In Sinn Féin’s view, his assessment is absolutely correct,” the West Belfast representative said. He accused Theresa May’s government of being “in hock to the DUP”. “It is blatantly obvious they are abandoning any pretence of the rigorous impartiality demanded of them by the Good Friday Agreement,” Mr Maskey said.